Guys, it snowed yesterday. And when I say it snowed, I mean is S N O W E D. Hard. We probably got at least 6 inches downtown (I heard more in the northern parts of the city). It's so crazy to get such a big snow storm so early in the season. I can only imagine how hard this winter is going to be and I am NOT here for it. Anywho...I asked a lot of you on Instagram yesterday if you had heard about the Enneagram. A lot of you know your number, and a lot of you asked for more info. I had hoped to put a full post up on it this morning, but I want to give it some more time, so I hope to have something up next week. Stay tuned! You might have also heard me mention on Instagram that I had to go shoot a skirt in the snow. Well...here you go. Aside from looking completely crazy to passerbys, it really wasn't too bad. We jumped out, got some picks, and then jumped back into our seat heated car. Piece of cake. I'm so glad ended up shooting though, because I love the way this shoot turned out. Shorts in snow and all. It doesn't hurt that I am completely obsessed with this outfit! I'm just praying it's warm enough here on Thanksgiving day, because I think I'm going to have to wear this now (instead of this) if it is. Wish me luck. This gray turtleneck, brown skirt and OTK boots is the perfect fall outfit if you ask me. I love the combination of warm neutrals here. (In case you didn't know, I live for neutrals.) I'm also super into skirts and sweaters together, and this one tops them all, if you ask me. This gray turtleneck is the SOFTEST ever! I am wearing a small here, but wish I would have sized up to a medium for a more oversized fit. It's sold out in gray, but stay on the lookout for restocks. It also comes in several other colors here. The brown skirt is actually a skort. (Which came as a surprise to me, only because I didn't read the product description.) The brown sold out yesterday, but they have it in black here. I sized up to a medium and it fit perfectly! I paired it all with my favorite OTK Stuart Weitzman dupes - that are currently on sale for under $100! I'm working on a ton of Holiday content. Gift Guides, Holiday Dresses, Christmas Jammies and more. If there is anything specific you want to see, be sure to let me know! These pictures came out fab in the snow! But wait... snow in the fall?! Say it ain't so! You look adorable, I'm sure you are freezing but you look amazing. I love the skirt and those boots together! That sweater definitely looks so cozy! The photos turned out so well in the snow! I love the whole outfit, so chic. Thanks for linking up! Your snow photos are gorgeous! 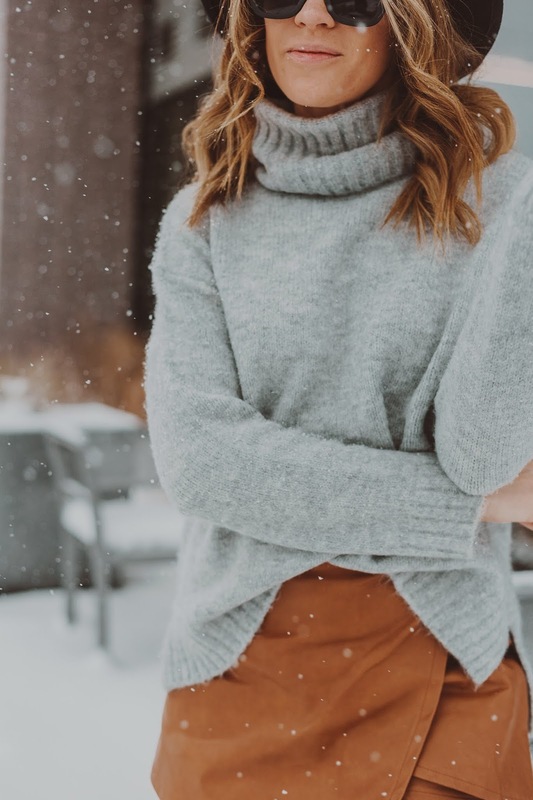 Love your skirt styled with those boots and cozy sweater! These photos are gorgeous! These neutrals are so great together! Beautiful outfit and I love the pics in the snow! You look wonderful, the mix of tan and grey looks fab. Very nice look!" Great sweater!